Preferred Habitat: In North Carolina, the flier inhabits coastal plain swamps and creeks, ponds and backwaters. Fliers tend to be more dominant as the pH of the habitat decreases. 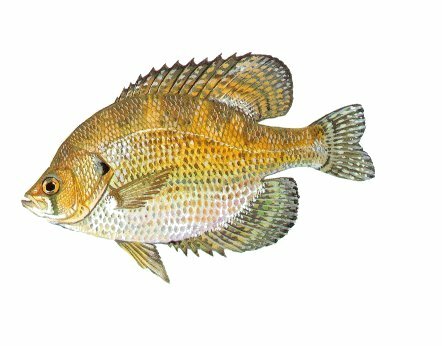 Although it is occasionally found in the Piedmont section of North Carolina, it is considered a coastal plains fish. Common Size: 5 inches and 3 oz. Food Habits: Fliers feed on small fish, insects and other invertebrates. Spawning: The flier, like all sunfish, prepares a spawning nest; however, their spawning activity begins earlier than most bream. As water temperature approaches 55-60° F, the female will deposit approximately 20,000-35,000 eggs, which are fertilized by the male who remains and guards the nest. Miscellaneous: Adult fliers are often confused with the black crappie, because of body shape and coloring. Young fliers have a distinctive orange spot on the trailing edge of the dorsal fin.